Close view of the walls of the Fort, Rohtak. bl.uk > Online Gallery Home	> Online exhibitions	> Asia, Pacific and Africa Collections	> Close view of the walls of the Fort, Rohtak. 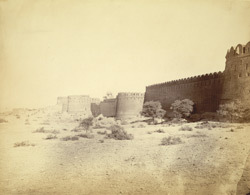 Photograph of a close view of the walls of the Fort at Rohtak, taken by Joseph David Beglar in the 1870s as part of the Archaeological Survey of India Collections (Indian Museum Series). This fort occupies a strategic location east of Rohtak town, Haryana from where it stands out boldly, forming a picturesque, striking object. Rohtak became a frontier between Sikh and Maratha powers after the disintegration of the Mughal Empire in the 1700s. In 1824 Rohtak became a district capital and was officially designated a city in 1867.